As urban farming gains popularity more and more people are looking to park lands as possible sites for food gardens and other food related activities. When done right this can work out well for all; increasing bringing new people into parks, reducing maintenance costs, producing delicious super local food, reducing crime and building community. Here in Seattle the Parks Urban Food System team is working on programs that promote growing, sharing and eating great food. The P-Patch program has several community and communal gardens on parks land as well. Here’s a great article from Grist on how governments are supporting food production on public land. Baltimore City Community Gardens: There are plots to rent and a big communal garden. In Austin, Texas a community group is working with their parks foundation to establish a new garden. In San Jose, CA the parks and recreation department manages several traditional, rent-a-plot community gardens. They also have a foundation supported, community run Veggielution Farm. Denver Urban Gardens for has a number of their community gardens on park land. 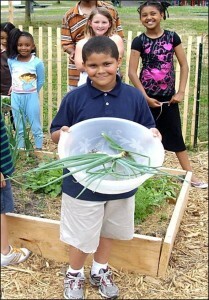 Knox Parks Foundation in Hartford, CT helps with several community gardens. Green Thumb in NYC – This is the largest community garden program in the nation. In Olympia, WA the Parks and Recreation Department for the City of Olympia manages two community gardens, with the goal of increasing that number in a ten year plan. They have a community garden coordinator staff member and a couple of community partnerships. there is a PPatch garden about 500 feet from my home. I am considering sharing my 700 sq.ft. vege garden area with another very local person/couple. How about extending the “communal garden” idea to private home owners, who have space to share. Would love to talk to the ppatch & shared garden admin. about this. Have you heard folks ask for this beyond gardening in parks? Lots of boomer gardeners who may want to share their garden as they age…..